NASA has a satellite, the WISE satellite. Wide-field Infrared Survey Explorer. It basically made a survey of the sky in infrared. It was a big deal. Many new discoveries, thousands of asteroids, numerous star clusters, and a whole wealth of data about the skies. Including information on millions of galaxies. Then scientists with private funding (our precious tax dollars saved for ever more drone strikes) computer sifted through this data to find 100,000 promising galactic candidates for further investigation. They then hand searched these galaxies, looking for galaxies with signs of widespread industrial civilization. How is that? Well, the idea being that aliens that colonized a galaxy would use starlight to power industry, and thus the galaxy in question would be shy on starlight, but long on infrared, the waste product of industrial processes. The results? Nada. None of the galaxies showed anything that was obviously unnatural. A few warrant further looking, but there was certainly no smoking gun. What can we glean from this? On the first pass, a Star Trek or Star Wars galaxy is ruled out. Bad news on one level, we won’t be joining any Galactic Federation anytime soon, because it doesn’t exist. That’s not surprising, the aliens in these sorts of imagined galaxies are pretty much just people with funny costumes. While it would be fun and comforting to find out that’s what aliens are like, there’s simply no reason to think aliens would be anything like us. In fact essentially all SETI has been doing is steadily eroding the idea of a universe populated by anthropomorphic aliens. At this point, it’s looking pretty grim for the Star Trek galaxy. So what’s left? Well, maybe our idea of how advanced alien civilizations would look needs some tweaking. Most, if not all, of our ideas about SETI involve searching for aliens who are acting like us. Granted, how to imagine aliens who aren’t like us is a bit tricky. I suspect the goal shouldn’t be to decide what to look for and look for it, but try to look for anything that doesn’t have a good natural explanation. Granted that’s a pretty nebulous concept in and of itself, but it has the advantage of eliminating our own prejudices about what aliens will be doing. And yes, it’s also limited by the fact that our understanding of what is and isn’t natural in the Universe is also pretty nebulous at this stage. Still, it would be a start, and I hope at least some in the SETI community are looking into searching for the unexpected. Lastly, and the point that seems to distress so many people, it’s possible that we are alone. We simply don’t know how likely it is for species like ours to come along and start building technological stuff. Maybe it’s so incredibly unlikely that it’s only happened once. People love to claim that the size of the Universe means there “has” to be others, but that’s simply an argument from big numbers. What are the chances that one grain of sand on Earth contains an exact miniature replica of a McDonalds® outlet down to the smallest detail? Saying, there’s trillions of grains of sand so one must contain a miniature McDonalds® because there are so many grains of sand, is an absurd argument. In any event I hope SETI continues. Heck, I wish it was better funded, but it’s too easy an idea to ridicule and there’s no SETI lobby to speak of, and certainly no SETI industry, so it’s going to continue to be a privately funded search. I wish SETI all the luck in the world, I just don’t recommend making any bets on it succeeding any time soon. The big flaw, in fact fatal flaw, in the argument is this. We don’t know how likely the formation of life is from natural ambient chemistry. We’ve never seen Abiogenesis in the wild, we’ve never achieved it in the lab. We have a lot of theories, and we know about the creation of self-replicating molecules, and we certainly haven’t come up with any good reason why DNA life couldn’t have evolved in some primordial soup. We know it happened once, because here we are. However, in any scientific, statistical, or logical sense, one data point is the equivalent of zero data points. If the creation of DNA life is unlikely enough, it may have only happened once. No matter how big the Universe is, there is also no end to how low the odds on an event occurring are. The typing monkeys demonstrate this. How likely is it that a monkey sitting at a keyboard randomly hitting the keys will type Hamlet by chance? Essentially zero of course. However, if we convert all mass in the Universe into typing monkeys, typing for the lifetime of the Universe, how likely is it that one of them will type Hamlet by chance? Still, for all practical purposes, zero. Is the creation of life as likely as a monkey typing Hamlet by chance? No one knows. And until we have a definitive answer to this question, speculating about life elsewhere is just that, speculation. Note I’m not saying there isn’t other life out there, I’m just saying that the affirmation that there must be other life out there is wrong. And when it comes to intelligent language using life such as ourselves, the situation gets worse. First, the odds clearly have dropped. Of the as many as 40 billion species that have evolved on Earth, only one has evolved tool-using, language, and intelligence. So humans may have been an unlikely fluke. Secondly, we don’t even know if our kind of intelligence is a good idea or not. Humans do seem to have some very self-destructive tendencies, and our species has only been around an eye-blink of time, maybe species such as ours quickly destroy themselves? Human intelligence may be an evolutionary dead end, until we find others like us that have been around awhile, or we last a few million years, we simply can’t say. It kinda gets even worse if one steps back a bit further. What if DNA life isn’t really life? What if DNA was invented by real life for information storage, real life which we haven’t ever encountered? We’re just a lab spill that didn’t get cleaned up? Or in the analogy above, we examine a cup of water from the ocean that a scuba diver dropped his watch into, will that watch teach us anything about the ecology and biology of life in the sea? 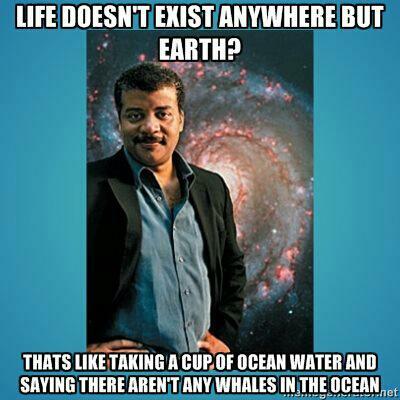 Mr Tyson, and people who make this argument, are in essence saying they can use the cup of water to prove their theory about what is or isn’t in the rest of the ocean, but other people’s theories make no sense. Excuse me? The bottom line is we don’t know how life appeared on Earth, so speculation about what is out there is just that, speculation. Speculation is never certainty. Well, I was disappointed that no one identified the image on the first post. How are we supposed to defend ourselves against aliens if we can’t even identify the fictional threats? Oh well. OK, this is the post about why I don’t think the first explorers the stars should be allowed to return home. It sounds harsh, but as I said before, they could bring home something much worse than syphilis. What could be worse than syphilis? Who knows. That’s my first point, when experimenting with one’s only habitable planet, some experiments shouldn’t be performed. Like pumping the atmosphere full of CO2 and methane, but I digress. And in the early stages of exploring nearby stars, why take the risk that a sample return could be malignant? Humans have done terrible damage to isolated ecosystems on Earth through accidental biological contamination, and Earth in a galactic sense is definitely an isolated ecosystem. It’s not had to imagine that some alien organism or bacteria could wreak havoc on Earth, as countless sci-fi movies and books attest. It’s easy to imagine pests such as we have on Earth, and that alone is sufficient reason to be very cautious about anyone coming home from the stars. Then of course there is the alien invader and/or parasite genre. The former is not likely to happen, the later seems very unlikely. Still, why take the chance? We are talking about the human race and Earth here. There’s no harm done if no one comes home from the stars. As for invaders, the idea is so anthropomorphic that it hardly bears mentioning. A superior intelligence could destroy humanity without going to all the trouble to sending in invading armies, and an alien race capable of actually infiltrating human society is again pretty much by definition one we would be helpless against. There’s some more exotic possibilities. In fact, considering that everywhere we look in the Universe we find stuff we never expected, it’s pretty safe to say that we will find exotic hazards out there. An idea I have been toying with, what if what we think of as “life” isn’t really life? Or maybe more accurately, maybe there is a form of life out there so radially different than us and so radically superior to us that we can’t imagine it. Maybe DNA based life is an evolutionary dead end, and will be quickly supplanted if it ever encounters other life. Only our isolation in a star system has kept our primitive form of life around. We may be no more than the Lord Howe Stick Insects of the galaxy. Lastly there are the unknown psychological effects of star travel. For all we know there is something about the Solar System that makes us uniquely human, and that leaving the Solar System will do something totally unpredictable to the human psyche. Granted that seems unlikely, but the truth is that “unlikely” is a judgment call based on our common experience. While it is certainly scientific to assume that the conditions for healthy human psychology are universal, it’s an assumption that should be tested without putting Earth at risk. Frankly I think the same case can be made for the first human visitors to Mars, but I think many would consider that paranoid. In most cases I would agree that minimizing the risks is the way to go, but when the consequences might be devastating to life on Earth, there’s no harm in shooting for zero risk. Fortunately the hurdles of getting the first explorers back from the stars are so large that the problem is unlikely to come up, if ever. Then again, I’ve often thought: If aliens exist and the hurdles of interstellar travel are surmountable … they are already here. 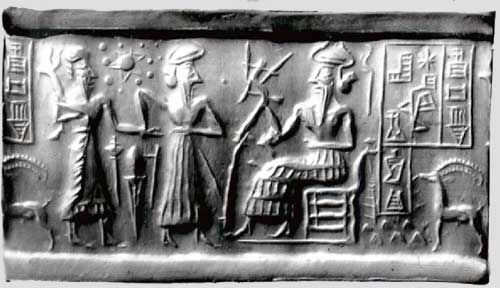 Here it is, proof that aliens visited the Middle East thousands of years ago, a Sumerian clay seal depicting the Sun surrounded by all eleven planets, with visiting planet Niburu by itself in the next open space to the right. Yes, proof positive that aliens have visited earth in the past. OK, yes, I’m being facetious. Even a little insulting and sarcastic, sue me. At the behest of reader’s comments, I reviewed online what is touted as the best evidence for alien visitation in human history. I was not impressed. This Sumerian seal is claimed to represent ancient knowledge of our Solar System having more than the traditional five visible planets (Mercury, Mars, Venus, Jupiter, and Saturn.) I suppose it could be interpreted that way, but eleven planets? Assuming it is even supposed to be the Sun and planets, how people explain the depiction of eleven planets quickly gets too torturous to bear repeating. Suffice it to say we don’t know much about ancient Sumerian astronomy, but I couldn’t find any serious references to the ancients having any knowledge of the Solar System beyond the visible planets. Nor did the idea of a Sun centred Solar System appear until thousands of years after the Sumerians were dust. 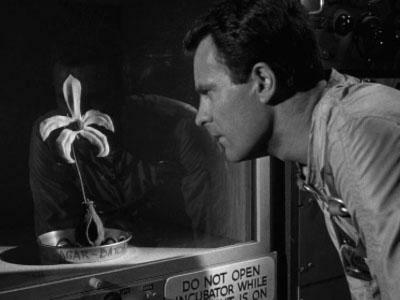 I don’t know what was being depicted above, but Venus in a field of stars is as good a guess as any. My point is that there is nothing definitive about the above image, so one can make any interpretation one wants. The Nazca Lines were mentioned. These are huge outlined figures in scraped soil in a desert in Peru made some 15 or 16 centuries ago. They were rediscovered, or at least weren’t brought to the world’s attention, until the advent of modern aircraft revealed their extent. Yes, they are very curious. Yes, we have no idea, only speculation, as to why these ancient peoples went to all this trouble. However, and it’s a big however, there’s nothing particularly remarkable about their construction. It didn’t take that many people to make them, nor were any particular arcane skills involved. Ancient peoples did all sorts of stuff that seems pointless to modern people. Because we don’t know why they made these figures isn’t evidence of anything. They wouldn’t have been to only people in history who thought the Gods were looking down on them from the skies. A lot is made about how ancient people’s moved such huge rocks around. Again we have a number of problems with this as evidence of alien intervention. First of all, a lot of progress has been made understanding ancient engineering. So right off the bat we have a line of argument that has been steadily weakening the past few decades. And it wasn’t a strong argument to begin with, and was often exaggerated to make it stronger. No, the blocks making the pyramids weren’t so finely cut that a piece of paper can’t be slid between them. Gaps between them are often big enough to stick one’s fist into them. The pyramids were an amazing accomplishment, and there is no doubt lots we still don’t know about them, but the mysteries they still hold don’t require any alien intervention to explain. Then there’s the ancient Sanskrit writing in India. I can’t even be bothered to look up the reference, because a decade ago I read a book on same. If the gentle reader doesn’t know what I’m talking about, they’re not missing anything. Long story short, in this huge body of ancient mythical literature, there are a few passages that could be interpreted as descriptions of flying machines or space flight. There’s also passages in the Bible that could be interpreted as same. And other references too I am sure. The problem here is the same ol same ol retrofitting problem. If one has a theory, and searches for evidence that supports the theory, one can find evidence that “fits” the theory. Um, so what? Unless the evidence of alien visitation is so clear that every other interpretation isn’t viable, it’s not really evidence. Yes, this is setting the bar rather high. That’s because when one theorizes that leprechauns invented human civilization, anyone with a brain is going to require powerful arguments and strong evidence. As one more aside, a lot of people don’t seem to understand that at least some of the people promoting alien visitation claims and similar such are doing it for the money! Gasp, would people simple make stuff up to sell books and make buckets of money? Yes, yes they would Virginia. I have a hard time grasping how someone can fervently believe the claims made by say Von Däniken, but not believe that he might be simply lying? 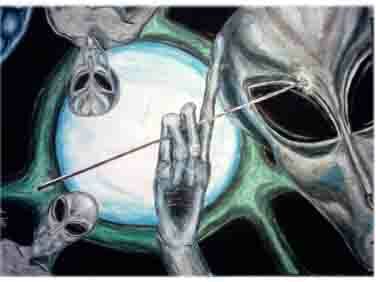 Alien visitation is more likely than a human being lying to make a buck? No doubt some adherents of radical theories are serious, but a huge amount of nonsense gets injected into the debate by charlatans. And then repeated as fact by the credulous. Sigh. On the plus side, pseudoscientific nonsense aside, there is really good news in the search for ancient aliens. Since it’s entirely possible that aliens not only exist and have visited the Solar System, there are sound scientific reasons for looking for evidence of same. Any empirical evidence of alien technology would be fascinating and informative for any number of scientific disciplines, and even the search for same has interesting scientific aspects, so mainstream science is indeed moving beyond looking for alien radio beacons in the stars. There are a number of promising avenues of investigation in the search for ancient alien visitors to earth. That’s my next post. Or some future post. I think the next post is on the frightful rise of elder immolation in the USA. There’s been some new thinking in SETI research. Well, it’s not that new, but it’s been brought into prominence by an important SETI researcher recently. His theory is that biological intelligences such as ourselves will quickly evolve into, or spawn, thinking machines. And those machines will also quickly evolve, and that such machine intelligences would want to live where there was plenty of matter and energy, galactic centres and hot young stars. Thus we should be concentrating on looking there for signs of alien life, since such alien machines civilizations would be far longer lasting than biological intelligences. Well, fair enough. With SETI discussions we do have to start with the codicil that we might as well be arguing about how many angels can fit on the head of a pin, our database is that small. Still, even in the information is limited, logical arguments can still be constructed by making assumptions and building on them. And this is what the esteemed Seth Shostak has done. And while I don’t think it can hurt to listen where he suggests as part of ongoing SETI efforts, my thinking is that he’s wrong. My thinking being if that machine intelligence is possible (it is just an assumption,) and it does evolve as quickly as Seth Shostak postulates, wouldn’t it quickly get to the point where such intelligences could literally rearrange stars or make artificial stars? In fact such structures and creations should be common, shouldn’t they? And so far we’re seeing nothing in that department. Still, I wonder sometimes if anyone is looking for stuff like that. Patterns and such in the layouts of stars. And such patterns might not be immediately obvious to the naked eye, but software could be designed to look for them. Stars laid out in the pattern of a giant buckyball or something would obviously have to have been artificially placed. By the same token I wonder if we might accidentally stumble onto star system engineering with our new planet searching missions like Kepler. For example it’s been proposed that to terraform Venus we might build some sort of giant orbital sail to literally shade the planet periodically to cool it down. And something like this around a nearby star could be detectable with current technology. The media has fostered the idea the appearance of aliens will be a dramatic event, but I suspect it’s something that’s going to come out of left field. Scientists announcing for example that not only does a nearby star have an earth like planet, the planet appears to have three absolutely identical equally spaced moons orbiting it. That or something like it would be pretty hard to explain as a natural phenomena. Which brings us back to my previous idea of searching Lagrange Points. And frankly, I’m liking the idea more and more. While there are no large objects in the Lagrange Points near Earth, there is indeed dust and objects up to one metre in size. And when we get to some of the Lagrange Points in other parts of the Solar System, like those near Jupiter, some of them have asteroids in them. Um, if aliens are gonna park some sort of Solar System observatory near our Sun, an asteroid in a Lagrange point would be an obvious first choice. Especially if one considers that such aliens might want to be found. And if they were thinking in terms of tens of thousands of years, a Lagrange Point is an obvious point to leave us a message in a bottle so to speak. I also wonder if Lagrange Points could act more or less as repositories of flotsam and jetsam that has “washed up” so to speak on the shores of space. I don’t know enough about orbital mechanics to even guess on that one. In any case, I’m only a humble and ignorant blogger, but I think Lagrange Points should be getting far more attention from the scientific community. Even if we find no alien artifacts in same, just samples of whatever dust and asteroidal material there would be of immense scientific value. It’s not like an asteroid or Lagrange Point probe is going to be wasted money. Sampling the dust and pebbles at the near Earth Lagrange Points for example would not only give us some cheap and interesting stuff to study, it would be a great way to develop sampling technology that could be deployed anywhere. I mean, going out there and looking is incredible beyond words, but the next step is bringing stuff back for scientists to get their claws into. So, are we not planning to explore the Lagrange Points because there is some logical reason they are of no interest, or has the UFO fringe factor scared off legitimate enquiry? I’d really like to know. This photograph is another historic first in space exploration. The big orange blob in the centre is a star, prosaically named ﻿1RXS J160929.1-210524. It’s a k7 dwarf star which means it’s a little smaller and cooler than our Sun. It’s about 500 light years from Earth, so we are seeing this star as it was just a few decades after the new world was discovered (well, rediscovered) by Columbus. In any event, here’s the historic part. See that little orange dot at the upper left? That’s a planet orbiting 1RXS J. 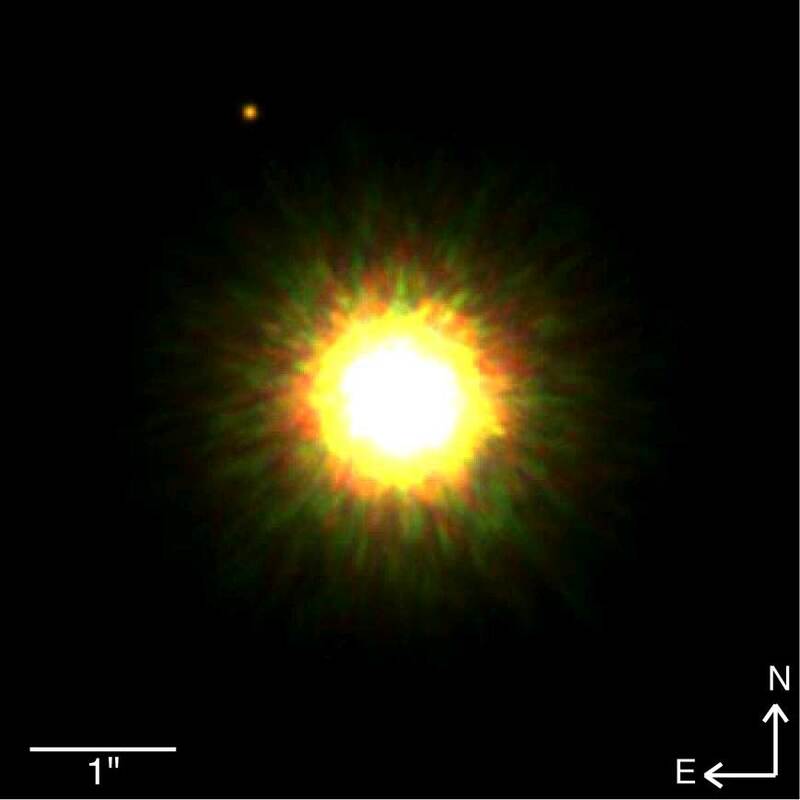 This is the first photograph ever taken of a planet orbiting another star using visible light from a ground based telescope. This is something that in my youth was thought to be impossible, but science just keeps moving along. It’s not a terribly interesting planet, at least from any practical standpoint. It’s hotter than Jupiter, larger than Jupiter, and orbiting at a vastly greater distance from its sun than our Jupiter does. Its heat comes from the fact that it’s a new planet, maybe only some five million years old. Still, this is one cool photograph in my estimation, but I am a bit of a space exploration nerd. Once, a man found Mulla Nasruddin searching for something on the ground outside his house. On being asked, Nasruddin replied that he was looking for his key. The man also joined in the search and in due course asked Mulla: ”Where exactly did you drop it?” Mulla answered: ”In my house.” ”Then why are you looking here?” the man asked. ”The light is better out here,” replied Mulla. Granted we may eventually find a beacon, but it’s probably not our best option. We could set up a radio receiver to carefully listen for things like military radars and carrier waves and other accidental alien made microwave noise from nearby stars. Alas a receiver that sensitive is a bit out of the SETI budget right now, so we’re stuck with optimistically listening for beacons. Another tidbit I picked out from the book is that radar searches of the Lagrange points didn’t find any alien probes parked there. (I discussed Lagrange points in an earlier post.) Well, to be more accurate, they didn’t find anything bigger than a metre across. Well, who says an alien probe has to be bigger than a meter across? Aliens with advanced technology might be able to build a perfectly fine probe in a small package so to speak. So I still think more efforts should be made to search various Lagrange points in the Solar System. It’s just such a logical place to park a probe if one wanted to monitor the Solar System. Well, one logical place. It’s also been pointed out that something orbiting in the asteroid belt would be a good place to hide. (And no, the asteroid belt isn’t this seething mass of colliding boulders as is shown on so many incredibly lame sci fi shows and movies, snarl.) The point here is that a huge probe would look like a small asteroid, so for all we know we’ve already spotted alien probes in the solar system. We just haven’t recognized them yet. Lastly, since this seems to have turned into a pure SETI post, I’ve decided that I’m even more convinced that aliens either don’t exist, are so rare they might as well not exist. My thinking here is that even in our first few decades of space exploration we have left very obvious signs of our presence on two bodies in the Solar System already, not to mention dozens or hundreds of defunct probes and space junk floating around in space. And some of this stuff is going to persist for a long time, the tracks made by the rovers on the Moon will be visible from orbit for hundreds of thousands of years. And the landers and such on the Moon will be around for millions of years. 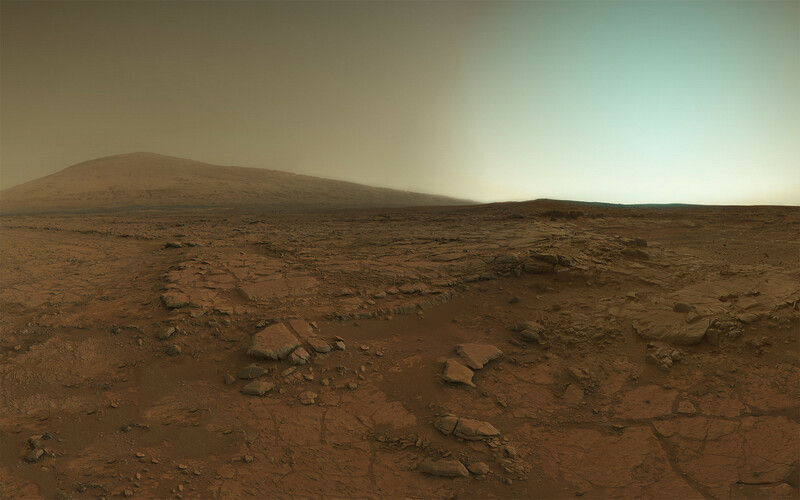 The stuff on Mars won’t last as long, but still, there will be obvious signs we were there for centuries at least. My point here is that in a few short decades we have left a lot of debris around the Solar System. Well, if interstellar travel is at all feasible and there have been aliens visiting the Solar System, they’ve sure been careful not to leave anything behind. High resolution images of the surface of the Moon and Mars have been public for a long time, and lots of people have gone over these images with a fine tooth comb … and found buttkiss. That’s not to say we won’t find something some day, but if we really lived in a Star Trek or Star Wars type galaxy with aliens flitting all over the place in starships, shouldn’t there be more junk laying around? I mean, one can go to the smallest remote island on Earth, and there will be human made debris washing up on the shore. Granted we haven’t looked on all the “shores” of the Solar system yet, but I’m more convinced all the time now that aliens fall into the same class as Bigfoot or Nessie, it’s getting awfully hard to explain the lack of empirical evidence. So one can safely go see the new Predators movie, knowing full well that the chances of actual hostile aliens showing up to use us for target practice is negligible. No, Aliens Will Not be Solving All of Our Problems; plus Fermi’s Paradox Solved and Alien Abductions Explained. "Hold still, this won't hurt ... much." I’ve been reading a book about SETI and boy, it’s everything and then some one would ever want to know about SETI, the “Search for Extraterrestrial intelligence.” In excruciating detail, page after page, chapter after chapter. And everything we have discovered about alien intelligence can be summed up in five words: “We don’t have a clue.” So, um, it’s not a very exciting book, but it sure is detailed. Reminds me of medieval scientists debating how many angels can dance on the head of a pin. I don’t recommend reading it unless SETI is a lifetime interest or better yet, an obsession. Moving right along, the book does have a few interesting points which I will get too by and by. The first point is in fact what drove me to write this blog post. There are many chapters on the possible consequences of contact with aliens, something about which people have given a great deal of thought. And there’s a whole school of thought about superior aliens giving us the solutions to our problems, and how that would effect our culture. Our energy shortages, our food shortages, war, cancer, disease, all the myriad problems that humans face today … many believe that aliens can or will solve these problems. From dyed-in-the-wool Roswell cultists to serious social scientists people have debated the possibility of aliens solving our problems for us. Even the late President Reagan had thoughts along these lines. Um, I have a problem with this alien saviour idea. Several problems in fact. And thank goodness, if I agreed with everything I read, this would be a very boring blog. First off, the stunning similarity between hoping and expecting aliens to solve our problems to the ancient idea that God/angels/the saviour will come and solve our problems. If a modern idea looks just like an ancient fairy tale except for a few props, what, exactly, is the difference? In other words this isn’t a new idea at all, and is so archetypal to human culture and civilization, that’s it’s hard for me to avoid the conclusion that the “aliens will save us” idea is just wishful thinking. Yeah, we’re too “modern” to believe God will fix everything for us, but it’s OK to believe that equally imaginary aliens will do so? No, it’s not OK, in fact it’s equally as illogical, at least until there is some indication that intelligent aliens even exist. Secondly, even a cursory look at how “superior civilizations” on Earth have helped out their less advanced brethren speaks very poorly of the idea that a superior alien civilization will be able to help us out. Most of the efforts to “help out” the natives on this planet have been cynical in the extreme, painfully misguided, and often both at once. And the results have not been pretty. Sure, some have fared better than others. Japan adopted western civilization with amazing aplomb, the Maoris did OK for themselves, Tonga held out for a long time … but for the most part civilizations that came into contact with more modern civilizations have been reduced to museum exhibits, scholarly treatises, and mass graves. And their people, if they survived, are second class citizens to this day. If the native Americans had any clue what the future held for them, they would have finished the job at Jamestown and every other settlement the Europeans tried to set up. Lastly, and the reason I find people’s belief in beneficial aliens solving our problems to be so deluded, is this. We don’t have any problems! With modern technology and industry we live in an age of unbelievable wealth and productivity. In almost any area one mentions we now have resources and tools that even 50-100 years ago were undreamed of. In fact it’s safe to say that in the entire modern era, since the widespread construction of factories, steamships, and railroads … we have had the ability to easily house and clothe and feed the world’s population at very acceptable standards. And our powers have grown since then. People are not dying of starvation, disease, lack of clean water, lack of shelter, or any of the other “problems” the vast majority of the world’s populations suffers through because there are shortages or we don’t know how to provide these. The food Americans throw away would feed 200 million people for god’s sake. People are dying for lack of modern amenities because of distribution problems, period. And these problems are caused by greed and politics and racism and religion and corruption all the other wonderful attributes that separate us from the animals. I mean, how can it be described as a problem … if were doing it to ourselves? The aliens aren’t flying over head thinking “Gee, let’s give these guys some machines that will turn dirt into food, and boy, all their problems will be solved!” No, they’re flying over head saying “Oh, Dear god, would you look at that? Those people are starving, how come no one’s bringing them any food? And look over there, they are filling up that gulf with toxic hydrocarbons! And there, there, did you see that … they are blowing each other up! I don’t believe this! What’s wrong with these creatures? !” I mean let’s be real, how else would superior beings react? Unless they can somehow tie us all to some sort of super alien psychiatrist’s couch and fix the tangled knots in our heads, giving us more gadgets and knowledge isn’t going to help. In conclusion, I have thus solved both Fermi’s Paradox and the alien abduction phenomenon. Fermi wondered why we don’t see any aliens despite the arguments that alien intelligence should be common in the Universe, the “where is everybody” theorem? They’re hiding from us because we are clearly nucking futs as a species. Would you contact people who strapped bombs on their bodies and blew each other up, or built super remote control machines so that bored teenagers in Kansas can blow up wedding parties on the other side of the globe? Of course not, especially if you’re a superior, intelligent alien. And alien abductions, well, the superior aliens are trying to help. They’re doing their best to figure out what’s wrong with us. And they clearly aren’t making much progress. So if you wake up in the middle of the night and aliens are dragging you into an operating theatre and preparing to insert probes in various bodily orifices, stay calm, they’re just trying to help. And better yet, even if you’re uninsured they’ll still treat you and there’s no copay! Yes, the aliens are socialists. Have a great weekend everyone.